What will we eat when all the food runs out? Last week, the Yukan Fuji (June 20) reported that 20 outlets in the Kappa Sushi conveyor belt sushi chain in east and west Japan are promoting an all-you-can-eat special, with patrons from middle-school age to 64 years charged ¥1,706 (boys and men) or ¥1,490 (girls and women). Seniors over 65 can partake in the same gargantuan feast for just ¥1,058. A time limit of 70 minutes applies and certain menu items are excepted from the arrangement. The campaign continues until July 14 on weekdays and is limited to the hours from 2 to 5 p.m. The participating Kappa outlets have reportedly been mobbed by crowds of people who have to take numbered tickets that are also printed with the waiting time, which can be as long as 15 hours — plenty of time to work up an appetite. But amid this apparent plenty, Japanese are finding, to their dismay, that seafood is very much a finite resource. Take unagi kabayaki (skewered and marinated grilled eel filets), which was once so ubiquitous it was even served in low-budget chains favored by salarymen such as Yoshinoya and Sukiya. Five summers ago due to declining catches, the aforementioned two chains dropped eel dishes from their menus, as did Hanaya Yohei, a chain of Japanese-style family restaurants. Imports have helped make up for a part of the shortfall, but the life cycle of the eel is a complex one, and efforts to breed them in captivity have been unsuccessful. The days of cheap and plentiful eel are likely to be gone for good. The Sunday Mainichi (June 18) reported that a shortage looms for another popular seafood item: katsuo (bonito). Traditionally consumed at the beginning of summer, katsuo appeals not only for its good taste, but also its comparative affordability. This year, however, at three fishing ports in Wakayama Prefecture — Susami, Kushimoto and Tanabe — the catch has declined to one-tenth from the peak in the year 2000. So paltry was the catch at Susami this year, the town was forced to serve refrigerated fish at its annual festival. Similar tales of woe are being heard from fishermen in Kochi, Miyazaki and Mie prefectures. According to the Ministry of Agriculture, Forestry and Fisheries, the bonito harvest has suffered declines for four consecutive years, falling year on year by 300 tons. The 2016 figure, 248,000 tons, was slightly more than half of the 446,300 tons caught in 1984. While the bonito’s migratory habits and life cycle are not fully understood, the cause of the declining catch is attributed to overfishing. In recent years, large vessels from Indonesia, Taiwan, South Korea and other countries have been trolling for bonito in the Western Pacific. Over 20 years ago, Akira Nihei, a guest researcher at Ibaraki University and member of the Japan Skipjack Tuna Society, issued a warning that bonito stocks would eventually run out. Without an international agreement to reduce the total catch by about half its current levels, he predicts that bonito is facing exhaustion. The Sunday Mainichi’s writer reminds readers that dried bonito shavings, called katsuobushi, form one of the basic flavorings in many types of Japanese cuisine. Should the fish vanish from the seas, it would definitely make waves in the food industry. What we will eat in the future is almost certain to change, predicts the cover story in Nikkei Business (May 15). Titled “The Fourth Food Revolution,” it provides some food for thought about how the human diet will change in the 21st century. First, by the time the world’s population reaches 9 billion around 2054, demand for vegetable protein will have soared, reaching nearly 1 billion tons annually. Second, both in terms of water and other resources, animal proteins, beef in particular, will place a high burden on the environment that cannot be sustained. Should petroleum prices remain low, more investors will channel funds into agriculture and food-related industries. As major firms founder, small and medium-sized businesses can be expected to spur food-related innovations. In addition, information technology and biochemistry fields can be expected to come up with major innovations in both agriculture and foodstuffs. Of course, in a pinch we could always turn to insects. On April 23, some 20 young adults gathered at a bar in Tokyo’s Shibuya district to feast on pasta garnished with crickets, ant cocktails and a variety of other buggy treats, a dozen items in all. The event was arranged by Keio University student Yuta Shinohara, who has adopted the public alias Chikyu Shonen (Earth Boy). Shinohara sees his mission as disseminating the message that eating insects is both interesting and full of potential. He’s been experimenting with ramen noodles made with a cricket-based broth, and within this year reportedly plans to launch his own establishment boasting a menu of tasty dishes creatively prepared with bugs. 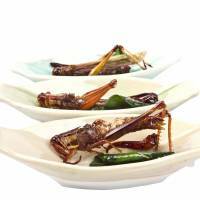 “There’s no reason not to eat bugs,” Shinohara remarked, praising their nutritive value and low impact on the environment. 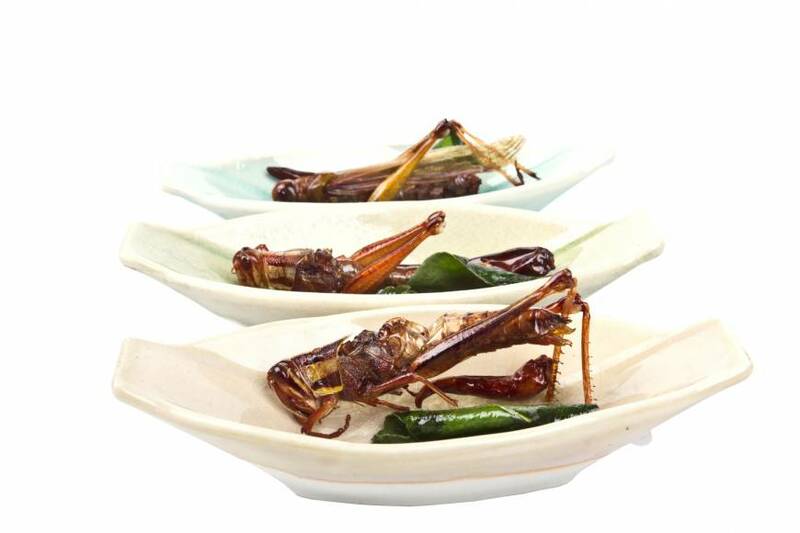 He listed his five favorite bug treats as crickets (“they’re like ‘river prawns'”); cicada larvae (“easy to eat, go well with Chinese-style seasonings”); a caterpillar that inhabits cherry trees; praying mantis (“creamy”); and South American cockroaches (“taste resembles miso, they’re great with Chinese seasonings”). Grilled gokiburi (cockroach) anyone?